The innkeeper had a ready reply for those who showed up at the door of Posada La Poza a little shellshocked from the road that leads to his gate. There’s an old saying in Mexico: Good roads bring bad people. We only want good people, that’s why the road is so bad,” said Juerg Wiesendanger, a Swiss native who created the upscale inn and restaurant with his Czech wife, Libusche. Highway 19 heads north from Los Cabos at the tip of the Baja California peninsula on a 47-mile drive to the seaside community of Todos Santos. A series of small signs point out twists and turns through the dirt roads of the town toward the Pacific Ocean, where Posada La Poza awaited. Along the mile-long route, there were wheel-jarring ruts, discarded car parts and sleeping dogs so lazy that you had to swerve around them. The inn’s four two-story buildings, painted a glowing orange and yellow, stand in a forest of greenery in the otherwise arid desert. Inside the gate, there is a garden of cactus, fruit trees and flowering tropical plants surrounding a pool, a freshwater lagoon filled with pelicans and egrets at the edge of the property, and the pounding waves of the Pacific beyond. The inn’s El Gusto! restaurant and each of its seven suites are decorated with Libusche’s fanciful artwork, and in her garden every rock and every plant is meticulously placed to showcase the Mexican landscape with a Swiss efficiency. Juerg was a banker in Zurich when he and his wife visited Baja in late 1997. The couple joined a growing number of expatriates who have found the perfect weather and quiet streets of Todos Santos to be a balmy reprieve from their once-hectic lifestyles. Posada La Poza, which opened in 2002, means “inn at the spring” in Spanish, and that’s kind of how the town of Todos Santos got its start. The 1,000-mile-long Baja peninsula is covered with scrub brush and cactus, but natural springs flowing from the Sierra de la Laguna range created an oasis of reedy marshes and palm groves. Jesuit missionaries founded the town of “All Saints” in 1723, capitalizing on the region’s only reliable water supply. For two centuries, the town flourished as an agricultural center with eight sugar mills. The rich growers built colonial-style buildings and homes. But a mysterious geologic event caused the water table to drop in the 1950s, and the town literally dried up. In what some saw as a miracle, the springs returned in 1981, bringing back ranching and organic farming. Three years later, two lanes of Highway 19 were paved from La Paz to Cabo San Lucas, running smack through the middle of Todos Santos. Artists arrived, led by painter Charles Stewart, a refugee from Taos, N.M. Surfers and hippies followed, and so did expats seeking an escape from the “L.A.-ization” of Los Cabos. Todos Santos got a reputation as an artist’s colony and an “Old Mexico” outpost. Today, the town has a few more paved streets and a population of about 5,000. The main thoroughfares are lined with fine-art galleries and shops selling Mexican wares. But beyond that, the dusty side streets have the Third World look of chickens roaming rubble-filled yards under laundry drying on the line. The restaurants mostly are small, serving up locally grown produce and the sea’s bounty. In the tidy town plaza, workers had strung banners overhead in preparation for a weekend art fair. The chic Hotel California, which has a restaurant, bar and interesting gift shop, is the top tourist attraction, helped, no doubt, by the urban legend that it was the subject of the Eagles’ hit song. Writer Joe Cummings, now a Todos Santos resident, tracked down Don Henley, who denied that the band had ever been there. Todos Santos is revered by people who go there for what it doesn’t have: condos, nightclubs, time shares, jet skis, beach vendors and McDonald’s. “Not yet, anyway,” said Juerg, the innkeeper. All are keeping a watchful eye on a new designation by the Mexican government in which Todos Santos became Baja’s first member of the more than 20 Magic Towns of Mexico. These “Pueblos Magicos” were chosen based upon their historical, cultural and architectural significance, reflecting their value as tourist destinations. The answer: Todos Santos. The secret, never well kept, was out. There are no chain hotels, but several inns have been refurbished or created in historic buildings to accommodate the visitors who are showing up. 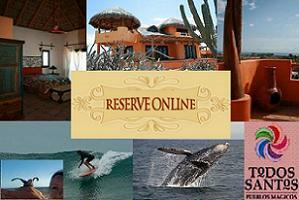 The loveliest may be the Todos Santos Inn, a restored, grand old hacienda in the heart of town. But when Juerg and Lubische visited in 1997, they discovered an untapped niche for their dream hotel. Posada La Poza was built with the water in mind. The town’s natural springs created a lagoon and bird sanctuary that draws up to 70 species at a time. The inn looks out onto the lagoon, and guests are given binoculars and field guides at check-in. Beyond the lagoon is the creamy sand lining the unruly Pacific. The waves that draw surfers to the area pound the beach, creating a nighttime lullaby that sounds like rolling thunder. The road in front of the inn ends at a rocky trail that runs at the foot of a hillside and leads to the beach. In winter and spring, guests from the inn get a special treat as pods of passing gray whales cruise the coast. Spouts, sometime three and four at a time, shoot from the surface, and the whales often come close to shore and seem to be playing in the surf. Todos Santos Eco Adventures will take you on a historical tour of town, then drive you to a waterfall in the desert. The adventure company also offers the chance to fish with fourth-generation local fishermen or head to the beach for surfing lessons with the promise that you will definitely ride a wave. Most visitors, however, stroll the streets – you can tour the whole place in an hour – visiting the boutiques, art galleries and craft shops. Shut Up Frank’s sports bar advertises the “best burgers in the Baja,” and Cafe Santa Fe is said to have the peninsula’s best Italian food. But, hey, we’re in Mexico! I went for a fish taco at Taco George’s stand, world-renowned chile rellenos at Miguel’s, fat shrimp simmering in garlic sauce at Las Fuentes and “tres licores” margaritas at the Tequila Sunrise Bar. The bar is across the street from the Hotel California and capitalizes on the mistaken Eagles connection, with the band’s farewell concert playing endlessly on a video screen. The group was singing “Life in the Fast Lane” when I asked owner Manuel Valdez Vazguez how many times he had heard the tune. “You mean today?” he asked. Vazguez is an articulate, loquacious man who will expound at length on the ingredients of his legendary margaritas, or give his take on the local politics that have propelled Todos Santos to the forefront as one of Mexico’s Magic Towns. “Do you have a bigger bottle?” asked a woman awaiting one of the drinks. Squeezing the juice of four lime halves into each glass, Vazguez moved on to the politics that might bring more development to what once was the back yard of the Baja. That was a mouthful, even without one of Vazguez’s tongue-tying margaritas. For sleepy Todos Santos, the significance of being named a magical place could be lost with the arrival of too many “improvements” like the one announced in the local newspaper on the day I left town. Developers from La Paz, which is an hour’s drive to the northeast, said they plan to build a hotel, condos, golf courses and a marina. “Company executives assure they will maintain the architectural and cultural elements of the town,” the newspaper said. To read more on Todos Santos and find accomodations, visit www.CalyCanto.com.